Home > General, SWTOR	> My Perspective on SWTOR Beta aka Skavak Will Pay!!! Oh, and there may be spoilers, so be aware of that now. 1. I played a stealthy in several other games. Something I never really enjoyed, though, was the stealthies in the KotOR games. So I was hoping SWTOR would BRING IT!!! I was torn between the Smuggler and the Consular, as the Scoundrel and the Shadow respectively gave me this opportunity. So, my time during beta was spent primarily playing these two classes. In addition, I played a bit with the Bounty Hunter, the Sith Inquisitor, and the Imperial Agent. I also didn’t get to re-commandeer (nautical term) my ship back, but I look forward to…shooting a certain thief in the face. 2. I absolutely loved the Smuggler storyline. What’s not to like about a space-cowboy character running and dodging baddies with a blaster and some grenades? Now add some clever lines, some flirtation, and a good ole’ Texan farmboy at your side? You also practically start with the title “Captain”. I have to say…that’s something I don’t think will get old fast. 3. I also loved the cover system, for both the Smuggler and my James Bond-esque Imperial Agent. I didn’t get far with the Agent because it was so close in combat to the Smuggler (which I played first), but it they both were pretty fun. For someone coming from WoW were most of the combat was pretty straight forward, the cover system provided a new dynamic I’ve never really seen before. Rolling behind a crate, throwing a grenade and shooting the living daylights out of Seperatists and Bounty Hunters? Too cool. Oh, and might I add…finishing a big armored guy off with a swift kick to the crotch…that never got old. 4. The familiarity of the UI and mechanics. Some have said it is just WoW repackaged to a Star Wars aesthetic…or WoW gameplay + Mass Effect/ Dragon Age Dialogue + Star Wars. Well, in a lot of ways they are right. 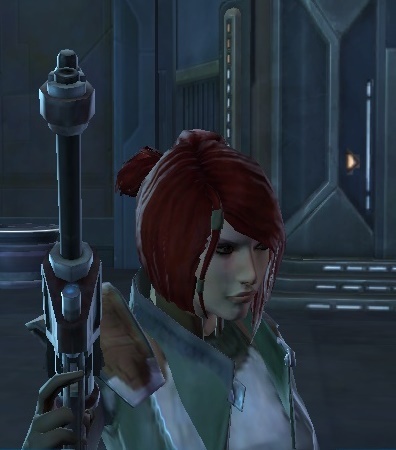 The upside for me, however, was how quickly after playing WoW I could pick up SWTOR and be able to figure it out. I didn’t sit around for hours confused and trying to see how everything worked, or breaking down and reading a manual (…Oh, wait…didn’t even have one of those yet). Also, having played KotOR and Dragon Age, I looked forward to the integration of dialogue and the anticipated lack of “Culling the Herd” type of quests typical to MMOs. In addition, I looked forward to the free-moving, faster play style than say DA: Origins or KotOR, but not so clicky-click like say Diablo II (which I got bored of really quickly back in the day). I was not disappointed. 7. The Bounty Hunter was incredibly satisfying. What’s as awesome as playing Han Solo? Playing Boba Fett. ‘Nuff said. BOOM! Now, ’nuff said. AND I’ll leave it at seven points. By the time I get this up, early access will be going or over, but I figured after putting the thought into it, I’d pass it out there for those interested. And by the way…Skavak will pay!